It may not be the longest, deepest or widest river in the world but few bodies of water reveal as much about a nation’s past and present, or are suggestive of its future, as England’s River Thames.Tales of legendary lock-keepers and long-vanished weirs evoke the distant past of a river which evolved into a prime commercial artery linking the heart of England with the ports of Europe. In Victorian times, the Thames hosted regattas galore, its new bridges and tunnels were celebrated as marvels of their time, and London’s river was transformed from sewer to centrepiece of the British Empire. Talk of the Thames Gateway and the effectiveness of the Thames Barrier keeps the river in the news today, while the lengthening Thames Path makes the waterway more accessible than ever before. 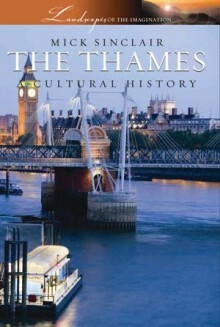 Through quiet meadows, rolling hills, leafy suburbia, industrial sites and a changing London riverside, Mick Sinclair tracks the Thames from source to sea, documenting internationally-known landmarks such as Tower Bridge and Windsor Castle and revealing lesser known features such as Godstow Abbey, Canvey Island, the Sanford Lasher, and George Orwell’s tranquil grave. PAINTINGS, WORDS AND MUSIC: Turner, Tissot, Whistler and Monet; Shakespeare at Southwark, Alexander Pope, Charles Dickens, Jerome K. Jerome, William Morris; Handel’s Water Music, the first rendition of Rule Britannia, the Rolling Stones and The Who rocking Eel Pie Island. POWER, POLITICS AND INTRIGUE: Runnymede and Magna Carta, the first English parliament, Whitehall Palace, Cliveden and the Profumo affair, the Houses of Parliament and the brooding headquarters of MI5 and MI6. TRADE AND COMMERCE: Eel trapping, osier growing; bargemen, watermen and lightermen; the rise and fall of London’s docks; urban regeneration, rural protection. MICK SINCLAIR is a seasoned author and journalist, and has written 17 travel, culture and history-related books including San Francisco (Signal, 2003).